The HWI group is a comprehensive service provider which covers the entire life cycle of medicinal products, medical devices and other related products. Advanced mass spectrometric applications for performing qualitative and quantitative analysis of small molecules are of great interest over the last years. The combination of high sensitivity and selectivity, which are requested by official bodies, has driven this information-rich technology to an essential tool in pharmaceutical analysis. Advanced mass spectrometric applications for performing qualitative and quantitative analysis of small molecules are of great interest over the last years. The combination of high sensitivity and selectivity, which are requested by official bodies, has driven this information-rich technology to an essential tool in pharma analysis. The variations and permutation combinations of different ionisation techniques with the different analysers provide the analysis of divers chemical entities at the femtogram level. 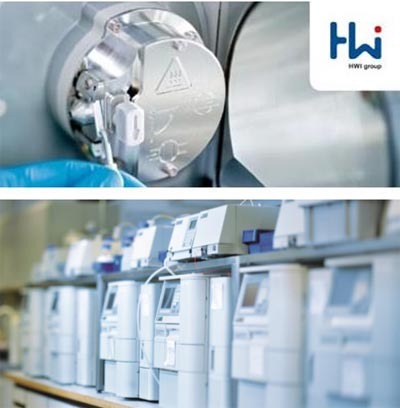 HWI provides a variety of MS instruments to fulfil the requirements in regulated GMP environment, such as quadrupole, triple quadrupole (QQQ) and quadrupole time-of-flight (QToF) mass analysers coupled to LC and GC systems. As powerful ionization techniques EI (coupled to GC), ESI and APCI (coupled to UHPLC) are available sources. Our experts are developing appropriate methods for each type of molecule and question to provide a full quality assessment of your pharmaceutical compounds and products. We are pleased to personally discuss your current questions and looking forward to our collaboration!